It was a rainy Saturday in Lagos, Nigeria but that didn't stop the large number of tourists that came out for the train ride to the ancient city of Abeokuta, the Ogun State capital. At 8:00AM Nigerian time, Bassey and Francisca local experts at My Guide Nigeria and over 30 tourists from different countries assembled at the Ebutte-Metta train terminus in Lagos. 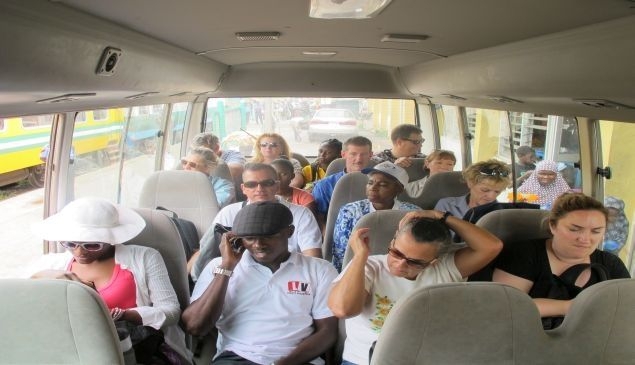 There was so much excitement as some of these tourists spoke with the Mydestination Nigeria team about their expectations and how they have been looking forward to the tour. At 12:00PM Nigerian time, the train left Ebutte-Metta train terminus for Abeokuta. As we drove pass, it was an enlightening experience seeing Lagos from the railway tracks. Passersby waved at us while some chanted "oyinbo" (slang for the whites). Inside the train, we were thrilled with popular Nigeria and foreign tunes played from loud speakers and the Legacy president (The brain behind the tour) welcomed us on board the train. As we journeyed on, the urban city of Lagos gave way to tattered houses and then large vegetations. 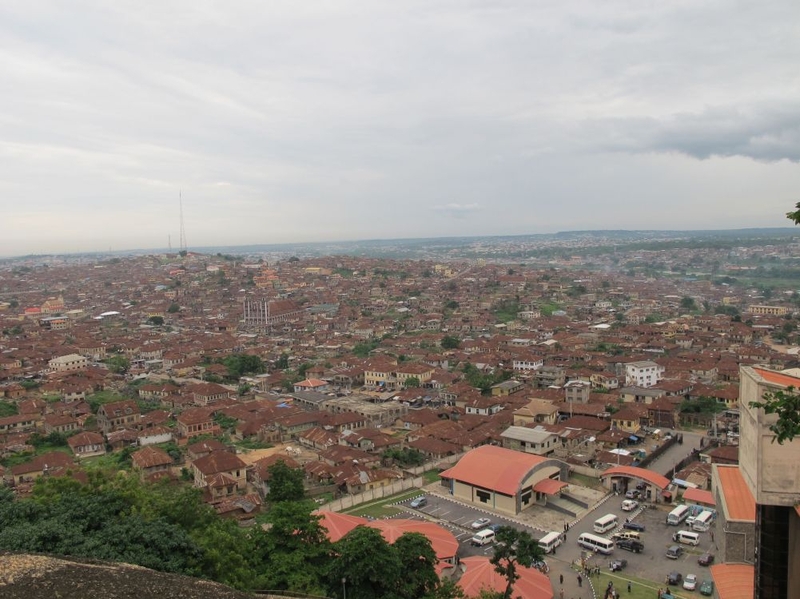 Ogun State, is an hour drive from Lagos by road and three hours by train. The state is bounded by Ondo state on the North, Oyo and Osun States on the East, Lagos and the Atlantic on the South and the Republic of Benin on the West. The state is regarded as the Cradle of Education in Nigeria because of it's long history of academicians and it is presently the only state in Nigeria that has about 21 higher institution. The rain had already stopped by the time we got to Lafun, the train terminus in Abeokuta; the one storey building at the terminus and the locals selling drinks and other refreshment informs you of your arrival. It is important to note that the railway track doesn't stop at Abeokuta. It leads you further into the South West and some Northern States in Nigeria. From the train station, we drove into the city as our tour guides gave us a profile of the city and taught us the anthem of the State. We drove pass the Nigerian Union of Journalist Secretariat where the first new paper was produced in Nigeria by an Anglican missionary Reverend Henry Townsend in 1845. Next up was the second oldest secondary school in Nigeria: Abeokuta Grammar school. The school was attended by prominent Nigerians like Fela Anikulapo Kuti and Oluwole twins. A few meters from the Palace we saw the Saint Peters Cathedral Church, where the first church in Nigeria was built. The Anglican missionaries who came to Nigeria in the early years built this church after holding services in the home of Shodeke (an indigene of Ogun State) and he was the first to receive the bible in Nigeria. 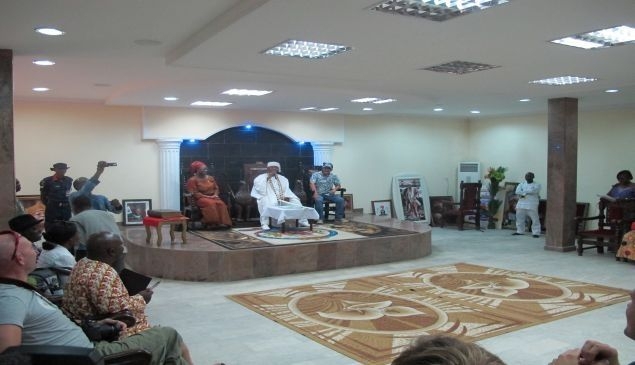 The palace of the Alake of Egbaland is the home to the traditional ruler of the Egba clan. The entrance to the palace has tall trees planted side by side and different dolls representing their deities and ancestors (tourists are not allowed to snap without the permission of a guard). The hallway to the chambers is beautifully decorated with pictures of the present Alake with different leaders of the world, his 70th celebration of his enthronement and those of his forefathers. Alake Adedotun Aremu Gbadebo III was a general in the Nigerian army and as part of his welcome speech, He talked about his ascension to the throne and about the oldest bible in the palace. According to him, his forefather Sagbowa sent a letter through Missionary Henry Townsend to Queen Elizabeth of England asking her the secret of the kingdom. In reply, the queen sent a bible and marked out Proverbs 14:34 and told him (Sagbowa) to read it as a guideline to rule his people. That bible was kept in Saint Peters Cathedral till 1900 when the church was burnt down by fire. On hearing about the fire incident, King Edward the 8th sent a replacement of the bible in 1904 and the bible is still in the palace. We made our way to Olumo Rock which is a short distance from the palace. 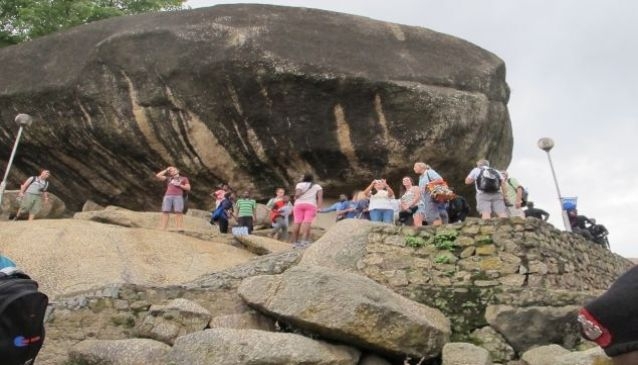 Olumo Rock is a mountain that dates back to the days of war in the yorubaland. The rock was used then by the Egbas from Ibadan as a shelter from the war. As a result of wanting to preserve and at the same time showcase the culture of their people, the government made the rock now a beautiful center of attraction for mountaineering and picnics.An elevator was built for those who cannot use the stairs to get to the top (suitable for people of all ages). Olumo Rock has sculputres and cowries planted from the entrance to the top and also the footprint of the early dwellers. The rock has a diety that is appeased on the 5th of August every year. During the appeasing ceremony, sacrifices and prayers are offered to the deity to protect the people and guide them from harms way. According to our guide, she said the olumo rock has not recorded any casaulty because of this annual sacrifices and prayers. Directly under the rock is a cave that houses the Orisa Igun shrine and her devotees. The devotees have a cave to themselves where they stay all year round making sacrifices and prayers on behalf of the people. Also available within the premises are museums that have paintings by local artists on sales, beads, locally made flower vase, sculptures and also the traditional outfit of the town masquerades. There is also a restaurant that serves mouth watering African and continental dishes. Visitors don't have to worry about where to seat and have a lovely meal after their climbs. At the top of the rock you get a panoramic view of the city and you get to see the houses of prominent Nigerians who are from the state. You get to see the house of Chief Olusegun Obasanjo (former president of Nigeria), Late Chief M.K.O Abiola (a philanthropist and winner of the June 12 presidential election in Nigeria) and the first mosque to be built in the state. We met some people already at the top of the rock; some posed for the camera while others talked about the view. As you make your way down via the stairways, you see a disco hut where popular tunes of Fela Anikulapo-Kuti (Fela was an indigene of Ogun State) is played to entertain people. The trip was adventurous and funfilled, The My Guide Nigeria team will like to say a very big thank you Legacy for organising the tour. 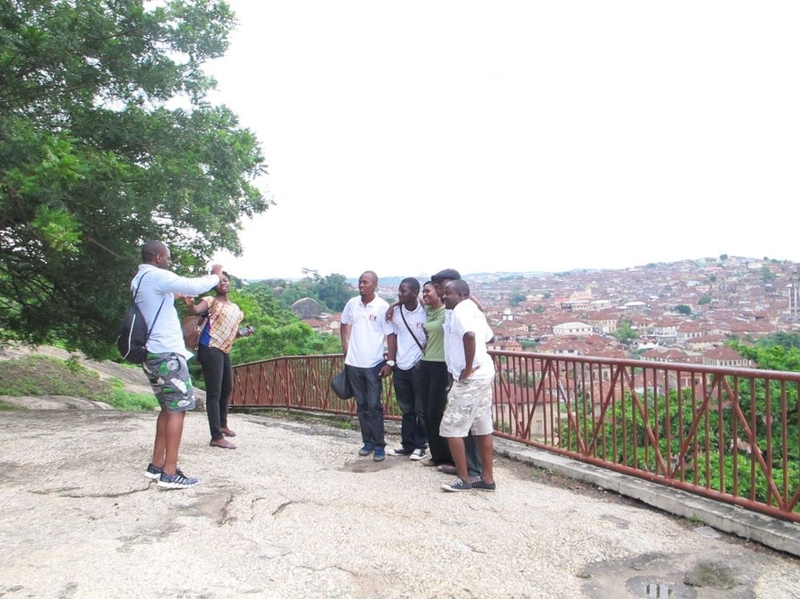 The Legacy Team is a historical and environmental interest group in Nigeria that organises tours to encourage Nigerian and foreigners alike to visit interesting places in the country. They also have a railway museum that they have used to preserve historical items belonging to Nigeria Railway Corporation. We could not visit the Adire Market and some other interesting places in the State, My Guide Nigeria team will be visiting them in the future to bring you more details about hot spots and also how they party at night. You can get more pictures from our facebook page and watch the video on our youtube.